. @UnionReport74: Union may conclude that detrimental effects of Janus can be offset with large-scale public demonstrations of union organizing ability. If so, we will see many more strikes and walkouts. There has been a lot of back and forth about the effects on union membership of the U.S. Supreme Court’s Janus ruling, in which the justices decided that public employee unions could no longer charge agency fees to non-members. 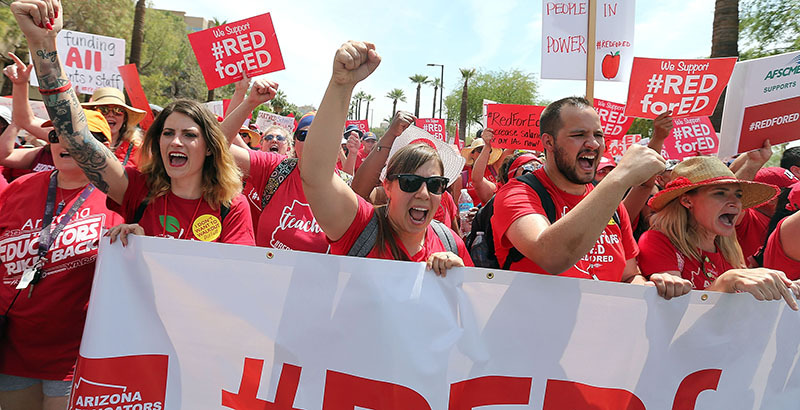 On one hand, the teachers unions have claimed that the June ruling, coupled with the 2018 teacher walkouts in West Virginia, Oklahoma, Arizona, and elsewhere, galvanized public education employees to stick with their unions. On the other hand, I have maintained that the recently reported annual union membership numbers from the federal Bureau of Labor Statistics, coupled with past experience from Wisconsin and Michigan, reveal reduced membership numbers when agency-fee laws are overturned. In an odd turn of events, it is very possible that we are both right. Economists Barry Hirsch and David Macpherson created the website UnionStats.com, in which they break down the source data of the annual BLS reports. While the figures don’t provide public school teacher union numbers by state, they do give unionization rates by industry subsets, including education. According to their statistics, in 2018, unions added as members 111,026 employees of elementary and secondary schools, an increase of 0.6 percent. This clearly supports the teachers unions’ assertion that they staved off Janus and have actually added members. But Hirsch and Macpherson also provide membership totals by state for all public-sector unions, and the results are startling. The 22 states, plus the District of Columbia, that allowed agency fees saw public employee unions lose 99,815 members in 2018. That doesn’t include the fee-payers lost, since these tables count only union members, and fee-payers never joined. However, public employee union membership rose by about 51,000 in the right-to-work states, cutting that loss in half. Where did public employee unions see large membership gains? Arizona, Colorado, Kentucky, and Oklahoma all saw substantial increases, which we cannot help but attribute to last year’s walkouts and rallies. The gain was not uniform. North Carolina’s demonstrations did not aid sagging union numbers. West Virginia, though it was the first of the bunch, also lost members. If the teachers unions’ internal numbers corroborate these findings, they may conclude that while the detrimental effects of Janus are real and significant, they can be offset with large-scale public demonstrations of union organizing ability. If so, we will see many more strikes and walkouts, even if they fail to produce additional gains for teachers.